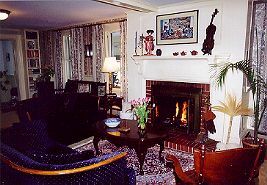 Situated on beautifully landscaped grounds on the outskirts of the city of Portland, our 250-year-old colonial Bed and Breakfast home has been completely renovated for your year round comfort. We offer modern baths, one with a whirlpool, a completely applianced guest kitchen, sitting rooms, library and solarium overlooking beautiful gardens in summer and pristine snow in winter. Breakfast is served on silver and china in our formal dining room. 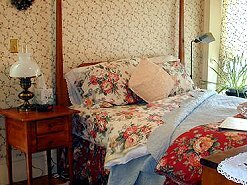 Bedrooms are filled with antiques and traditional furnishings including beautiful quilts and warm comforters for chilly Maine nights! Four miles from the historic OLD PORT; twenty minutes to Freeport and L.L.Bean! Directions: From I95 North or South, go to I 495, take Exit 10, West Falmouth, and turn right onto Route 26. We are 1.3 miles on the left, right on Route 26, the old stage coach run and Fall Foliage Highway! 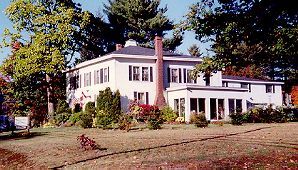 This and other Portland Bed and Breakfast Inns can be found here in The Register.